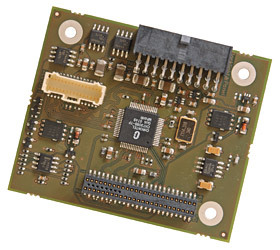 The "sDVO Link to LVDS module" (DOLL-1) gives you the option to connect a 24-bit LVDS LCD with 16M colors to the Core Duo based PIPs. The DOLL adapter is stacked onto the PIP20 on-board accessible sDVO port and converts this port into 24-bit LVDS signals. With the DOLL module, the disadvantage of just having a 18-bit LVDS port with max. 256k colors, as provided through the integrated Graphics Device used in Intel's 945GME chipset, can be eliminated. The DOLL-1 works with the standard Intel Graphics Media Accelerator Driver for the 945GME chipset. The DOLL-1 module can be used on all Core Duo based PIPs equipped with a sDVO interface. For example, it works on all PIP20-1 and PIP22-1. The DOLL-1 supports a maximum LCD resolution of up to 1600x1200 (UXGA) or 1920x1080.